If you spend some time selecting an industrial hose, you will find that there is a wide range of styles, models, and brands available. Add in the numerous hose coupling styles and materials and the possibilities can become overwhelming. But the selection process does not end there. An equally important and often less considered factor is the coupling attachment type. 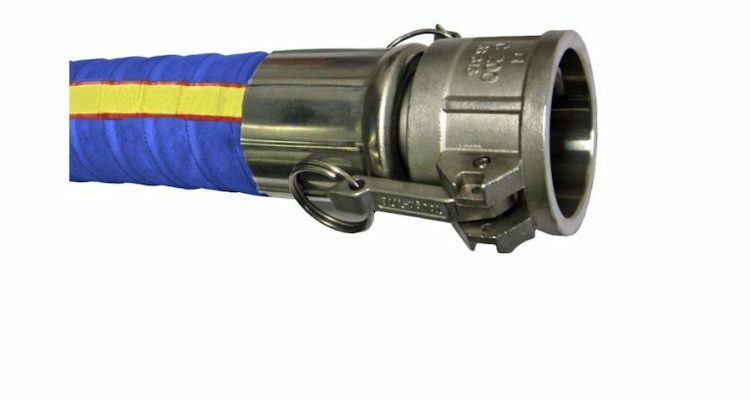 This is not only what can determine a hose assembly’s working pressure rating, it is critical to a hose’s end pull capability, it’s ability to withstand abrasion, and it’s overall durability. Starting at the lower pressure end, we have field attachable clamps such as the T-bolt clamp, double bolt clamp, double ear clamp, and others that can be installed using hand tools. These are good for quick repairs, short term uses, and low pressure applications where a leak or blowout would not be a major issue. 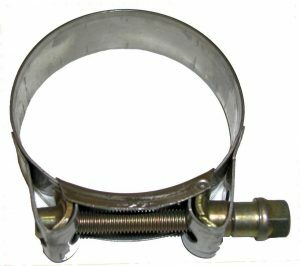 T-bolt clamps are also handy when installing a hose onto a barb or hose coupling that is already installed onto equipment or piping. Slide the clamp over the hose, slide the hose onto the barb, and tighten to the suggested torque. Bolted clamps must be re-tensioned periodically to ensure a tight seal as not only can the bolt loosen but the hose can expand and contract over time and with pressure. A single or double ear clamp has no bolt, instead you pinch the ears tight using a pliers or specially designed tool. These are primarily for lower pressure small diameter hoses (under 1 inch). Next is the band-clamped hose assembly, such as the center punch clamp, or its close relative the roll-over clamp. The main benefit of the band clamp is the elimination of the bolt, offering a sleek professional assembly. Center punch clamps require a special hand tool, which can be a bit of an investment, but then the per clamp cost is generally far lower than the T-bolt clamp. Many hose assembly models ordered from Capital Rubber will have a similar clamp applied using our pneumatic powered production equipment. These utilize a roll-over style clamp with a similar end result. A roll over clamp can be field installed using bulk strapping and buckles. Bulk strapping is of benefit when a center punch clamp will not fit over an existing coupling, or when assembling large diameter hose. Crimped industrial hose assemblies have emerged over the past decade as many hose coupling manufacturers greatly expanded the product line as industrial crimpers have become more common. There are two main categories of crimp type products, crimp sleeves and matched ferrrule and coupling sets. 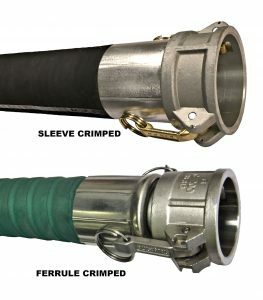 A crimp sleeve is a straight cut tube in stainless, plated steel, or aluminum that is crimped around the hose coupling using an industrial crimper. Sleeves are available in standard and short, and can be matched to most any industrial hose coupling. Ferrules include a lip that is designed to crimp into a matched groove on a special hose coupling. The ferrule and coupling set offer improved shank retention and higher working pressure ratings than the sleeve crimped assembly. Both types of crimp products are installed using a hydraulic hose crimper that can be dialed in to the exact crimp diameter for a safe professional assembly. Another type of heavy duty industrial hose coupling is the Internally Expanded Coupling. 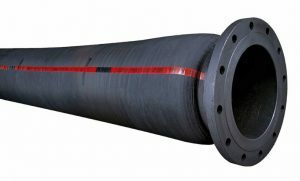 This type of hose coupling appears similar to a ferrule crimped industrial hose, however instead of a machine crimping around the ferrule, the coupling is pressed outward from the inside out. The coupling becomes the same diameter as the inside of the hose, compressing the hose wall into the ferrule. This allows for full flow, eliminating the build up of material around the coupling shank during use, and permanently attaching the coupling to the hose. This system is recommended for thick material pumping such as wet plaster, mud, and asphalt mixtures. Other types of internally expanded couplings are found on fire hose assemblies and curb-pump fuel hose assemblies. In some cases, none of the shelf hose assembly options are sufficient. When there is high end-pull, flexing or pressure, or a more rigorous application, a custom manufactured hose may be of benefit. Custom hoses take time and cost more up front, but once they are installed they typically have a longer and trouble free service life, reducing overall operating and replacement cost. When a custom manufactured hose is designed, a hose coupling can be built directly into the hose wall. This improves coupling retention and material flow, and can allow for the rubber tube to extend over the coupling surface so there is no contact with the media in corrosive applications. No matter what type of assembly you need, or if you are still unsure, Capital Rubber can help you to select the best hose assembly, couplings, and coupling attachment method based on your specific use. Contact us to continue the discussion.